I got the new extension cord run out to the shop today. I have about 2 more volts, so there is less loss to resistance than before. I can’t run much more than before, but I can do it safer now. I was leery of using the 3 lighter cords with the connections outdoors. It is not as good as the sub panel I plan on putting in, but it should get me through the winter. I think I would have just bought the Heavy Gauge Romex and used that instead of the extension cord , your going to have to use the Romex anyway when you install the sub panel. I got a good deal on this. It is regularly $150 cord and it was $85 off. I will be able to use it after the permanent wiring is done. It is rated for outdoors. The feed to the shop will be 6 gauge when done. Romex in 10 gauge would have been more money and not rated for outdoor use, and not very useful afterwards. It is plugged into a 20A dedicated circuit. Jim, in order to get a proper voltage drop reading you have to have the circuit under full load. Without a load the reading is of little use. 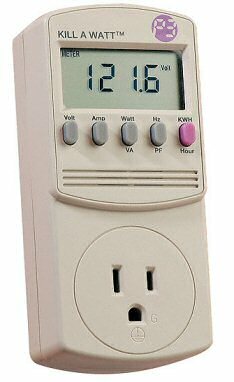 If it’s a 120 volt circuit you’ll find a ‘Kill-A-Watt’ meter really handy.